Reunited Dog after 5 Months Missing « LostDogs.ie Blog | Dog News, Dog Stories, A Blog for Dogs. 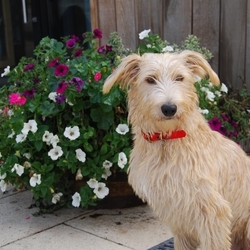 My lurcher bailey was stolen last march from castlepollard in westmeath. SHE HAS BEEN FOUND! A wonderful couple in Kilkenny 5 months ago found her in Kilkenny. They only recently saw her picture on the internet and checked to see if she was chipped. They rang me at the weekend and I confirmed it was her. I wanted to thank the forum for their help, advice and support. I will collect her at the weekend……I am soooo happy to get my girl back safe and sound. Here is a photo of Bailey home now safe and sound after 5 months missing! This entry was posted on Friday, January 15th, 2010 at 8:13 pm	and is filed under Found Dogs, Lost Dogs, Lost Found Dog Reunited Stories, News. You can follow any responses to this entry through the RSS 2.0 feed. You can leave a response, or trackback from your own site.